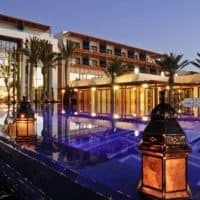 Visiting Essaouira, Morocco? Here’s how to make the most of your time! Essaouira, or Mogador is located on the western coast of Morocco. It is a small, sleepy town that has gained some prominence lately as a getaway from Marrakech. Today, the city retains a small-town feel but it wasn’t always this way. Archeologists have found remnants that Essaouira has been inhabited since prehistoric times. In the 1st century BC the Berber rule Juba II built a Tyrinian purple dye factory in Essaouira. The dye was exported to Rome and was used as the dye for the edges of Imperial Roman purple senatorial robes. The dye was worth more than gold! The fortresses that make up the old medina are perhaps the most noticeable feature. They were built by Portuguese conquerers around 1505 along with five others along the coast. By 1550 they were driven from all but three Moroccan cities. 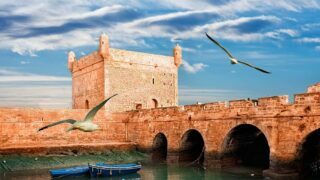 Essaouira was a stronghold for the exporting of sugar, molasses and a mooring point for pirates! Modern Essaouira was found in 1760 by Mohamed III in hopes of securing a harbor as close to Marrakech as possible. The king put a lot of effort into building this city as the principle shipping port in Morocco. He hired engineers and builders from various backgrounds to build up the city. 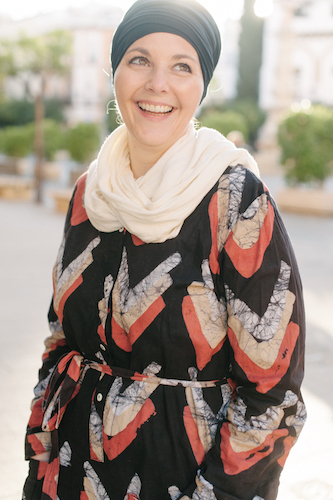 He encouraged foreign residents to move to Essaouira, hoping their connections and expertise would further build the city. Essaouira also had one of the largest Jewish populations in the country, at 40% of the population. There were more than 40 operating synagogues at any one time. Today a few survive and are being rehabilitated as a part of King Mohammed VI plan to save sites of important religious, historical and cultural significance. Essaouira grew to be so powerful that European nations had their diplomats and trade delegations stationed either in Essaouira or Tangier. Like the rest of Morocco, Essaouira fell under the French protectorate from 1912-1956. Until the 1960’s the city was known as Mogador and purists still insist this is the rightful name of the city. However for all intents and purposes it’s legal name is Essaouira. Today it has a laid back vibe and was known as a “hippie hangout” for decades. While Jimi Hendrix “Castles in the Sand” was said to have been inspired by Essaouira, the artist didn’t visit until two years after the songs’ release. 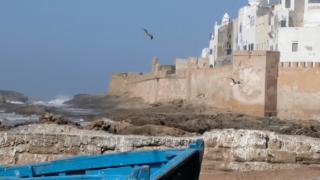 Chances are you may have seen Essaouira on screen. Its medina is a UNESCO world heritage site and has appeared in the HBO hit show Game of Thrones where it served as the city of Astapor. Gladiator , Kingdom of Heaven, Alexander , and Lawrence of Arabia all also had portions filmed in Essaouira. Just because it’s a small town, don’t think there’s nothing to do in Essaouira. While you might opt to just relax, sip nous nous, and people watch others may want to jump in the water with a kite board and catch some waves. There aren’t a lot of museums or traditional historical sites to be found in Essaouira but there are a few. The largest is the ramparts that line the city and the skala which was built to protect the city. On the lower level you’ll find shops that were once used for military fortifications. Some parts are under renovation but it’s still possible to wander in different areas. This is also where the scenes from Game of Thrones were filmed. The Ramparts run closer to the port. There are two different ways to get on top of the ramparts. First, you can enter at the actual entrance right before the port. The admission is about 10 dirham at last check. But, if you stroll down to the port, nearly to the end you’ll find a stairway going up. It’s actually possible to enter here and walk along the rampart and see the port from above as well as the old Portuguese and Spanish cannons. Essaouira’s Jewish population also left behind several synagogues. While there were around 43 operating at one point in Essaouira, only one still holds services. The Simon Attias (also known as the Chaim Pinto) synagogue is small and free to enter with a free will donation for upkeep. It’s small and is representative of a Sephardic synagogue. The synagogue is in the mellah area, currently being rehabilitated. This can be a sketchy neighborhood, especially at night so it’s advisable to visit and walk during the day. Cooking classes are popular all over Morocco. We highly recommend Khadija’s Kuzina classes that are held in her home. You’ll get to experience authentic dishes in a very homey atmosphere. Then you get to eat everything too! Perhaps the biggest tourist attraction in Essaouira is the port. Everyday small and medium scale fishermen bring in their catch around 10am. You can visit at anytime of day and find what’s fresh on display. Purchase directly from the sellers and have it grilled for you nearby. A great lunch and fun activity! Of course Essaouira also has a beach. The wind blows nearly all the time year-round so cool winds are always in the cards. The water however is quite shallow so it’s a good spot to take children as they can swim and play without the fear of large drop-offs. You’ll find families having picnics, surfers, and sand castle building during summer months. While Moroccans don’t often brave the water in winter, many visitors do and thanks to wet-suits it’s not too bad! Want to try wind surfing? It’s one of the activities Essaouira is best known for. If you already know how to windsurf you can simply rent equipment. If you need lessons those are available too. Pre-book to make sure you’re ready as soon as you arrive! 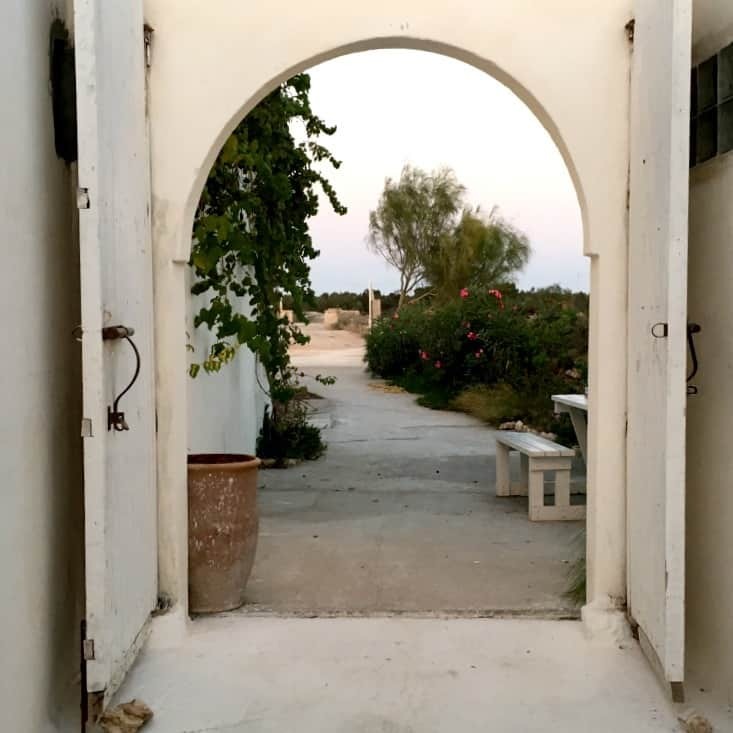 Whether you want to take a horseback ride on the beach or a longer adventure to neighboring villages there are a lot of options that begin in Essaouira. 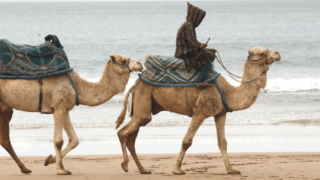 Of course if you dream of riding a camel on the beach that’s possible too. 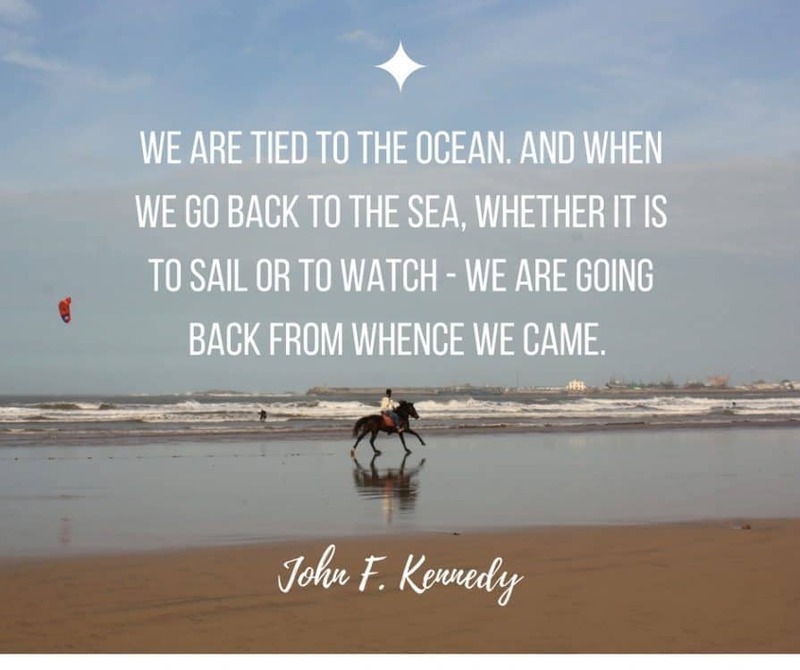 You can book your horseback ride in advance on Viator here. Prefer to go faster? Quad bike rentals and tours are also an option. There are routes on the beach and also through the forests that surround Essaouira. You can rent a quad directly on the beach or book ahead if you don’t want to deal with the haggling and different pricing you might find in person. The largest festival that happens in Essaouira is the Gnaoua Festival held yearly in June. This is an action packed weekend full of music and entertainment. If you want to attend plan early because riads fill up and the city is full! It is a great opportunity to experience West African music and culture. 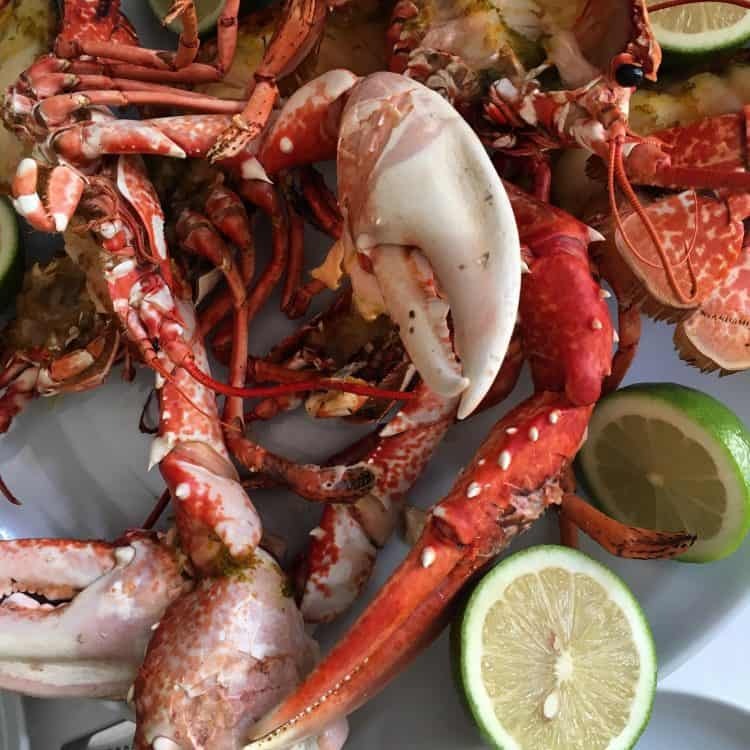 If you’re wondering where to eat in Essaouira you’ve got some good options – especially if you like seafood! This is my favorite thing to talk about! Along with these blog posts I have some other suggestions for our favorite spots. Something worth keeping in mind is that Essaouira is very seasonal. In winter months many restaurants operate on a random schedule or are completely shuttered. You should make sure to check before you go as to whether they will be open or not. Also in the winter it’s tough to find places open after 9pm – plan accordingly! I’m going to share a little secret here. Moroccan breakfast is pretty much the same no matter where you stay. 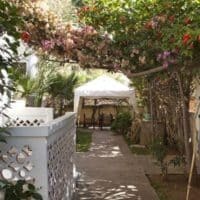 Whether it’s an upscale hotel or budget riad it’s all fairly standard. While some riads include breakfast some of the prices we’ve seen are upwards of $10 (per person) extra for breakfast! No, you can do much better than this! Every neighborhood has many hanuts – small shops that sell everything you can imagine. Stop by one, pick up some yogurt, bread, cheese, crepes, or other breakfast pastry. You’ll get these things for a tiny fraction of the price of your hotel breakfast. Then take your bags and make your way to a coffee shop. Order a coffee, mint tea, or juice and enjoy! This is totally ok in Morocco and I promise more cost effective. You can’t visit Essaouira without eating fish and seafood – it’s what this city is known for. You will find seafood abundant on restaurant menus but you can also choose to “pick your own” and have it grilled on the spot. If you feel really confident venture to the port and make your selections fresh off the boat. If you’re not quite as comfortable you will find many open air restaurants lining the end of Plaza Moulay Hassan (the big square just to the edge of the old medina). Choose what you want and they will grill it fresh for you. You could also take a cooking class and make your own lunch. We love Khadija’s Kuzina and recommend it to people visiting all the time. You might be asking what about picky kids (or adults)? While my boys are pretty adventurous eaters, they really aren’t big on fish and seafood. 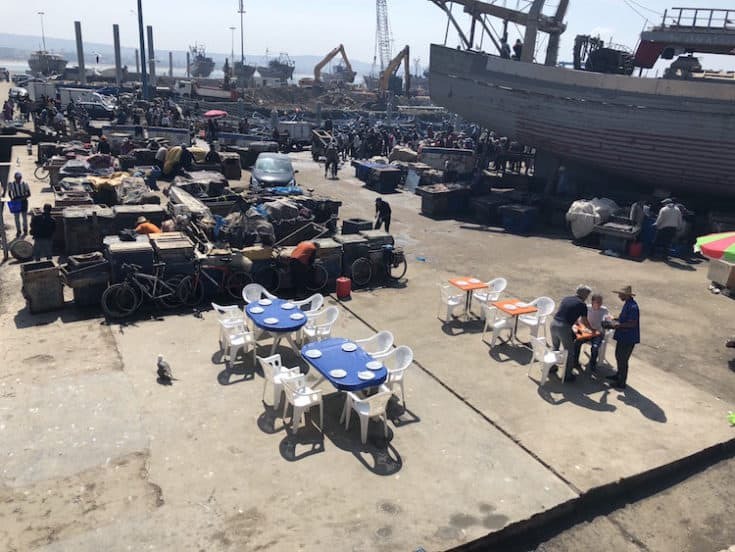 The good news is you can pick up something else for them, a shwarma, pizza, or other take away food and they can eat this while you’re enjoying the seafood. It’s no problem! If you asked MarocBaba why I go to Essaouira he would say for the crepes. You can find crepes in much of Morocco but they are usually only available at breakfast or late in the evenings at cafes. In Marrakech I find them to be pretty pricy, and always seem to have orange blossom water added which I don’t really care for. But in Essaouira they are sold all over the place for at least 1/2 of what they are in Marrakech. A Nutella crepe with almonds is only around $2! Each location has plenty of sweet and savory options. It’s my go to snack and breakfast..and sometimes dinner! Having an afternoon or after dinner coffee/tea in Morocco is similar to having tea in England. It”s a daily standard. It’s also a great chance to take a break, grab something to sip, and people watch. You can always get mint tea, and most places serve hot milk or hot cocoa a favorite of our kids. Moroccan coffee is called nouss nouss or kahwa hleb (you can make it at home too – here’s my recipe) and is at least 3/4 milk with a bit of espresso. Most shops now also give you a small bottle of water with your purchase. I have to admit slowing down and enjoying this tradition hasn’t been easy for me, but it’s now one of my favorite parts of the day. 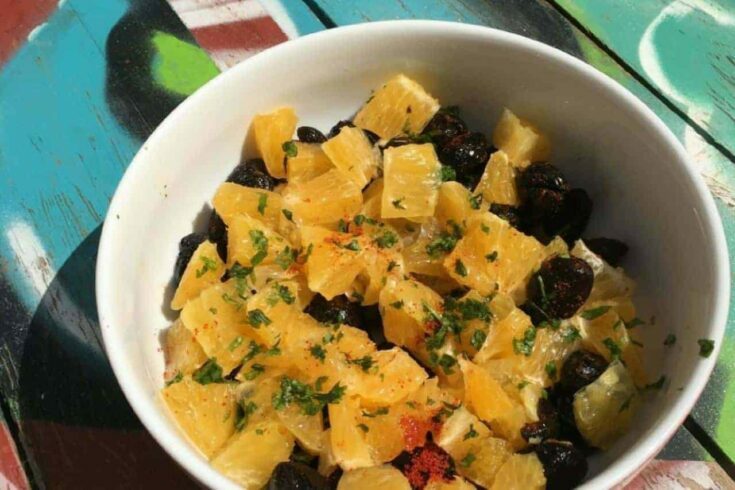 Dinner is usually a light meal in Morocco but that doesn’t mean you have to follow suit. There are plenty of locations that offer full “western dinner” standard options. Don’t be surprised if many don’t start serving until 6 or 7pm however. In winter time you may also find that many places are closed or operate on much more limited hours. It’s always a good idea to call and make reservations if possible or at least check on availability. 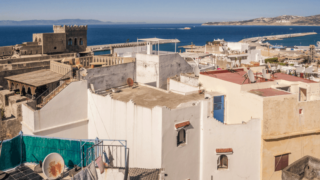 The great thing about Essaouira is that while you can find plenty of Moroccan options, there’s also quite a few international offerings due to the fairly large international community that has made it home. 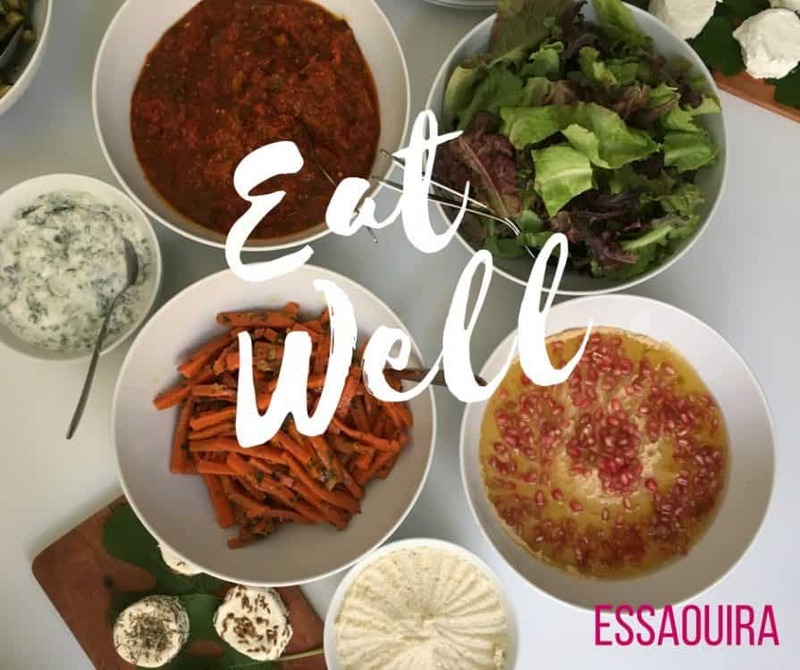 Looking for somewhere great to eat in Essaouira? Here are a few of my suggestions to keep you full! Buy your own fish and seafood and have it grilled nearby. A completely local and immersive experience! Listen up wine lovers - this one is for you. Did you know Morocco has wineries? We do. This is the only one in the southern part of Morocco (the rest are in the north near Fez) and it's gorgeous! You can go for a tasting and lunch - or just a tasting - or just lunch! They also have rooms so you can stay on site. This place isn't in Essaouira proper but you can easily get a taxi to bring you to and from - and it's worth it! 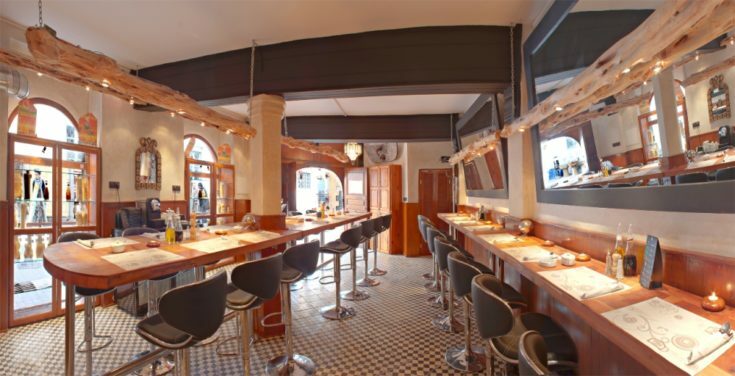 The restaurant is based around cheese and Moroccan dishes. It's fantastic! Mandala Society is a new restaurant serving fresh food with local ingredients. 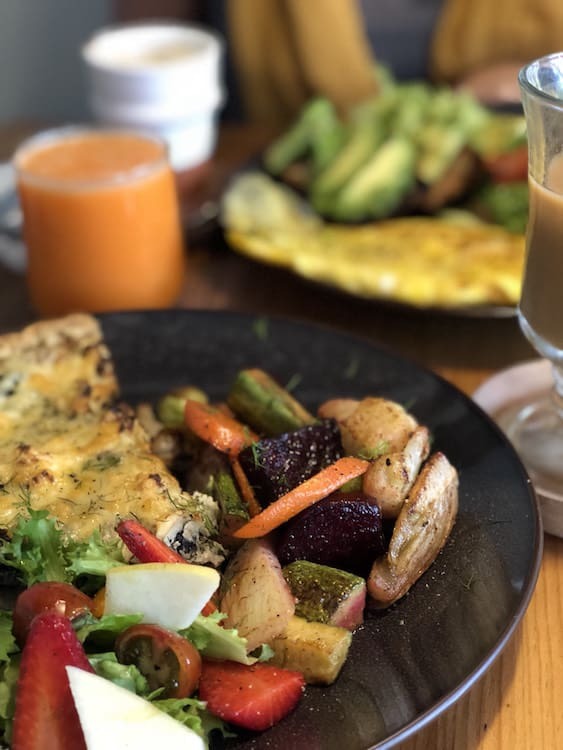 It's a largely plant-based menu with a gorgeous interior and ideal for a lazy brunch in Essaouira. We've loved the fire grilled pizzas here for a long time though lately them seem to not be quite as good. It's still a nice spot for an evening dinner, but not the best choice if you're in a hurry. 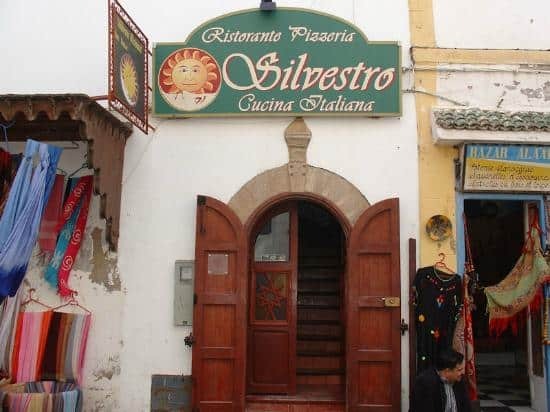 One of THE best restaurants in Essaouira, if not Morocco itself. I can't say enough good things about the food here. Love it. With a great location on the corner near the entrance to the skala they have fantastic pasta (with gluten-free options). The owner/manager is from Turin and the food is authentic and very affordable. 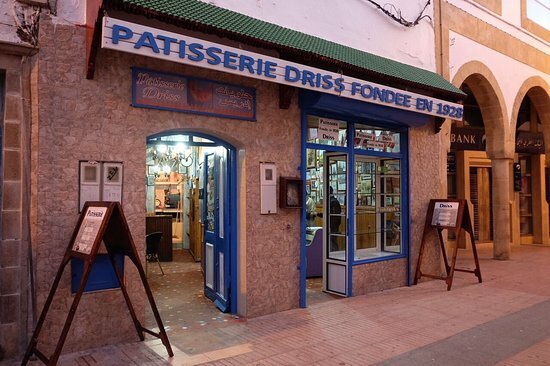 The most famous patisserie in Essaouira with great cakes and sweet treats. Eat in or take away. 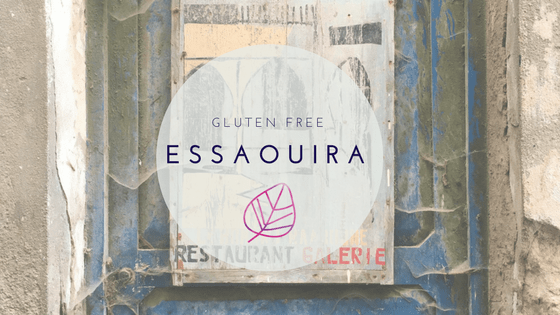 I put together this post with some of our favorite places to find gluten-free foods in Essaouira. If you're traveling gluten-free this is a good resource to help. Essaouira hotels are often lumped together with riads but they are two different things. 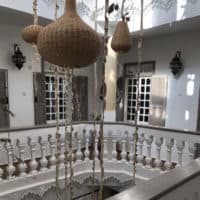 A riad resembles a bed and breakfast and we think the best place to stay. But if you’d rather a hotel there are those as well. 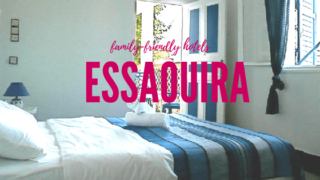 If you’re looking for where to stay in Essaouira with kids, check out our post on family-friendly Essaouira accommodations. While this town may be small it has no shortage of great places to lay your head at night. These are some of our favorite hotels and riads. 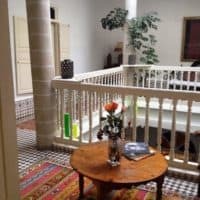 A great location just off one of the main streets of Essaouira. The staff here is fantastic and a good pick if you're traveling with older kids - you can book side by side rooms. We especially love the extra high terrace on this riad and it's fantastic breakfast spread. Opt for one of the larger rooms and enjoy relaxing in their downstairs sitting rooms. If you don't want to stay in the medina but want to be closer to the beach we recommend this hotel. It also has parking available if you'll be driving and large rooms that accommodate families. If the comfort of a modern hotel is more your style, you can find these in Essaouira too. The Sofitel is a luxury hotel but keep in mind it's not in the medina area of the city so you'll need o plan for transportation. You'll need your own transportation to get to and from here (or just plan to come and stay without leaving!) but it's a great retreat and quiet place to unwind. Fantastic food and gorgeous rooms! 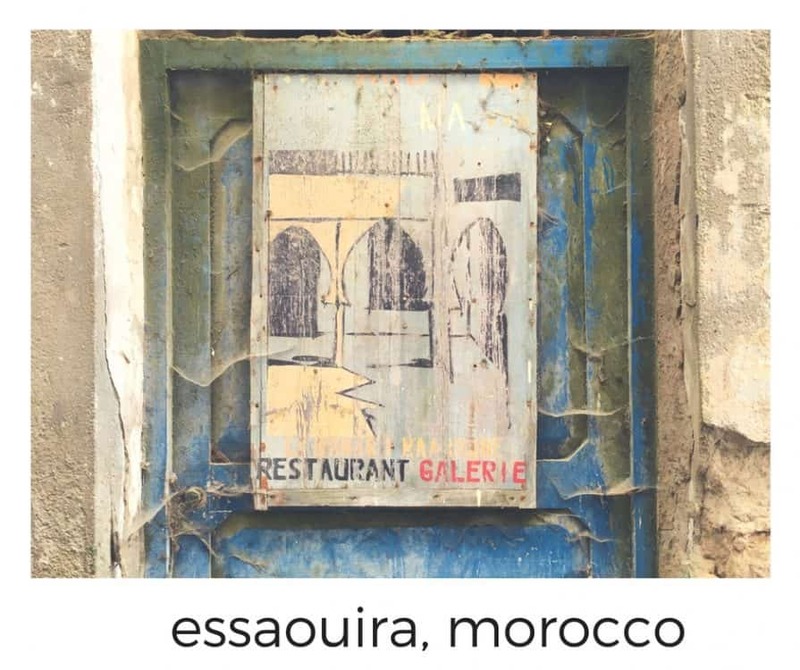 Looking for more information or inspiration about Essaouira? Try these posts. 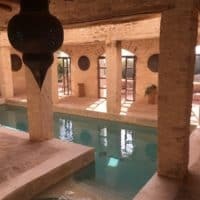 Suggestions on where to stay if you're traveling with family to Essaouira. 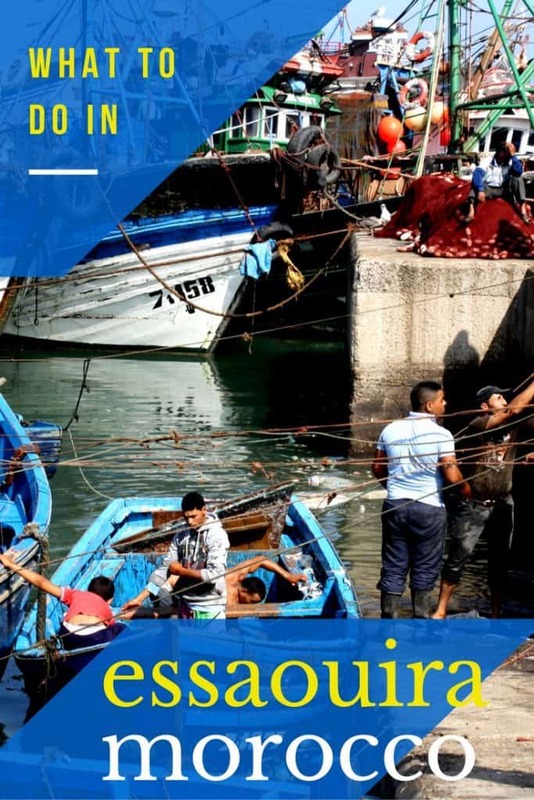 An inspirational story and interview with some of the fisherman that call Essaouira home. Morocco's "Pacific Coast Highway" this scenic drive is picturesque and great for a drive or to stay along. A long weekend in Essaouira is the perfect amount of time to get to know the city and spend time relaxing as well. 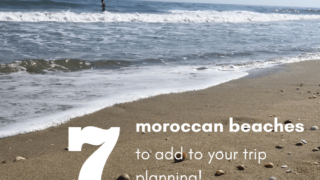 Where are the best places in Morocco to visit in the month of April? Try these four spots on for size. Essaouira's beaches are great for windsurfing but also offer spots that are good for swimming - even for younger kids. 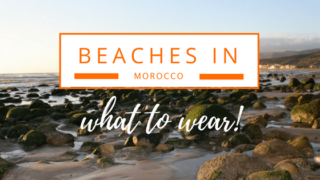 Wondering how to pack if you'll be visiting the beaches of Essaouira? This guide can help! 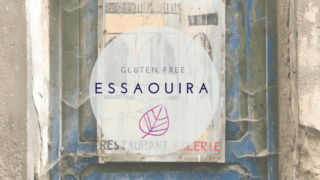 Eating while gluten-free in Morocco can be a pain but this guide can help you navigate in Essaouira.